Perfect for daycare centers, preschools, afterschool programs and more, this 12 oz. sippy cup is a must-have item for anyone with small children. 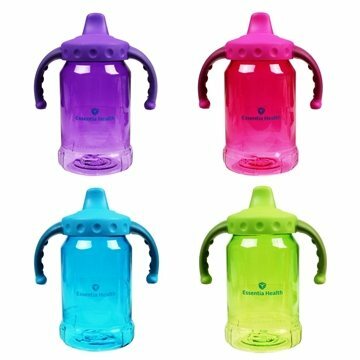 These toddler cups are available in an array of translucent colors and made of BPA-free, CPSIA certified materials that are approved by the FDA. This children's sipper cup is spill proof with a non free flow insert and has a screw-on lid. It handles easy for babies or toddlers to use. Comes packed in an individual poly bag and can be customized with your company logo on the side to increase brand awareness. size. Material. Well-crafted and sturdy. I'll order again of your stuff, appreciate everything. Just the right size we were looking for. Veronica does a good job. Most: Versatile; easy to use It had been precisely what we expected.